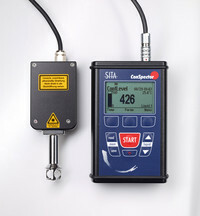 The SITA ConSpector controls the contamination level in cleaning and rinsing baths. An increasing contamination level causes a decreasing cleaning power. A high parts cleanliness despite of an optimal cleaning agent concentration cannot be guaranteed anymore if the bath is contaminated e.g. due to oils or greases. The light guide rod at the sensor head of the measuring device is immerged in to the sample to be measured. The measurement starts at the touch of one button. The contamination level is displayed within a few seconds. Based on this measuring result, an optimal point of time for bath care actions or preparation of a fresh cleaning solution can be determined. Failures of treatment measures can be quickly indentified due to continuous bath replenishment. For an easy operation, the measuring value is compared to an individually determined limit value and when exceeding an alarm signal is sent out by the device. Controlling the bath contamination ensures a high cleaning quality and thus high parts cleanliness for processes in the field of surface coating and surface treatment. Cleaning bath contamination is reproducibly detected due to the fluorescence measurement. Controlling the contamination level allows reliable and efficient process management. Evaluation of bath conditions depending on parts flow or bath operation time. Determination of bath contamination through fluorescence measurement. Easy control of contamination level in cleaning and rinsing baths. Start of measurement at the touch of one button and display of measuring result within a few seconds. Mobile and hand-held measuring device to be used directly at the plant or in the laboratory. Efficient bath management through an optimization of the bath operation time. Determination of contamination level at the touch of one button. Targeted initiation and control of bath replenishment actions. Identify operation errors e.g. stop of bath treatment actions. Automatic evaluation of bath conditions due to pre-determined limit values. Use of measuring device independent of used bath chemicals through to a calibration. Automatic saving of measuring data including date, time and temperature.